U.S. 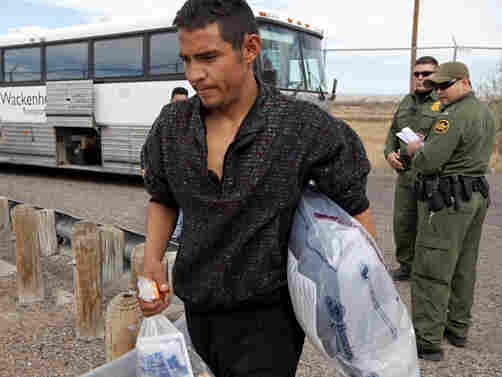 Buses Undocumented Immigrants To 'Nowhere' To discourage undocumented immigrants from re-entering the U.S., the Border Patrol is busing those it captures in Arizona to a remote border crossing in Texas, where they are sent back to Mexico. Officials call the program a success, but locals on both sides aren't happy about the nearly 100 young men dumped in their communities every day. The Border Patrol has hit on an idea to discourage undocumented immigrants from entering southern Arizona, the nation's busiest illegal border crossing. When agents catch them, they put them on a bus and send them 570 miles away to the remote port of entry between Presidio, Texas, and Ojinaga, Mexico. At noon on a recent day, the international bridge is nearly empty. A herd of goats grazes beside the Rio Grande. A big silver and white Wackenhut bus pulls up on the U.S. side of the span. The door opens and out steps a guard in a gray uniform and black boots, contracted by the Department of Homeland Security. The passengers follow. They are young Mexican men in sweatshirts and dirty jeans, all picked up in southern Arizona. They yawn after their long road trip, collect their belongings and give their names to a Border Patrol agent. Then they make the five-minute walk across the concrete bridge back to Mexico. Once they're inside the Mexican immigration office, a fresh-faced consular employee welcomes them to Ojinaga, Chihuahua — the last place they want to be. The crossing is the least trafficked of the entire 2,000-mile border. North of Ojinaga is the storied Big Bend country of far West Texas, a sea of thorn brush desert, canyons and steep mesas. There are no large cities where undocumented immigrants can blend in, which is precisely why the Border Patrol sends them here. "I'm going home with nothing. This is why I'm sad," says Jose Pedro Caseres, 23. "Thank God I'm alive, but I return just as I left — with nothing in my hand." Standing outside the immigration office, he disconsolately clutches a snack of tuna and crackers given to him by the U.S. government. His eyes brim with tears as he relates his ordeal. Caseres says he's a miner from Muzquiz, Coahuila, who was headed to Texas to work on a ranch. He says he walked for seven days in the Arizona desert — lost, hungry and exhausted — after a smuggler pocketed his $750 and abandoned him. He was caught by the Border Patrol in a ranch house he says he found open; he was devouring what food he could find. "I don't intend to try to cross again because it's a lot of suffering. More than anything, the suffering of my mother who worries about me," Caseres says. The Border Patrol's Alien Transfer and Exit Program, ATEP, began nearly two years ago between Arizona and California; it was expanded last month to Presidio. "The idea is to remove the smuggled aliens from the smuggling organizations," says Victor Velasquez, assistant chief agent of the Marfa sector. "It's to break the smuggling cycle." Most days, the Border Patrol sends 94 men to Presidio. From there, the Mexican government offers them a bus ride to Chihuahua City, where they can get bus tokens back to their hometowns. Several immigrants told NPR they had every intention of trying to cross into Arizona again. Nevertheless, the Border Patrol considers the program a success. A spokesman in Washington said that in the past two years, they've had a 35-percent recapture rate, which means 65 percent either stay in Mexico or they sneak back in and evade capture. In an interview, the Mexican consul in Presidio, Hector Raul Acosta, condemns the program. He says that detained immigrants are forced to stand for hours in crowded cells, they receive inadequate medical attention, and that families are split up — all charges the Border Patrol disputes. "This is a unilateral program the Border Patrol started without Mexican government agreement," Acosta says. Despite Acosta's public disapproval, the Mexican government is working hand-in-glove with the Border Patrol, Velasquez says. "That's the key piece in making this program a success. As soon as they're repatriated to Mexico, they're being bused to the interior of Mexico," he says. So far, almost all the immigrants deported to Ojinaga do hop the bus to Chihuahua City, rather than stay in the area, where there are no jobs. The Border Patrol says that in the first six weeks of the program, agents have not caught anyone who came from Arizona and tried to go north through Presidio. Still, local officials on both sides of the river take a dim view of nearly 100 young male adventurers dumped in their communities everyday. "When a city is small and when we've never had this sort of problem before, we thought, 'What are we going to do with all these people, when we can barely take care of our own citizens?" says Ojinaga Mayor Cesar Carrasco. In Texas, Republican Gov. Rick Perry went so far as to complain that the Obama administration is sending illegal immigrants to Presidio to "punish Texas." Because of the harshness of the terrain, human smuggling historically has not been a problem in Presidio County — an area more than twice the size of Rhode Island. "But now you start putting 700 a week through this port of entry," warns Presidio County Judge Jerry Agan. "I'm sympathetic with the people in Tucson, that they don't want the problem over there," Agan said, "but I don't want the problem in Presidio County." If border watchers have learned a truism about the U.S.-Mexico divide, it is that smugglers adapt. They always seem to find a way.